Musical Intruments and Accessories available from The Music Box Shop, Bristol. The Stagg Electric Guitar package with accessories including starter guitar lesson CD rom. 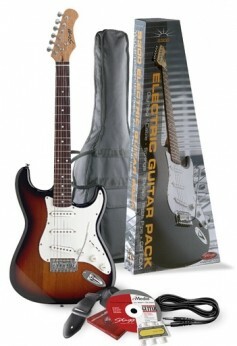 A good quality electric guitar package which includes a Stagg ST style electric guitar in tobacco sunburst. The package also includes a bag, spare strings, pitch pipes, strap and a CD rom eMedia disc with instructions on learning to play guitar. The Stagg ST style electric guitar is fitted with a rosewood fret board, 3 single pick ups, 2 x tone knobs, 1 x volume knob, 5 sway selector switch and tremelo arm.